Boat traffic is heavy near Mara Park: swim only in designated areas. Please specify the park name when sending/leaving a message. A popular day-use area for locals as well as travelers, Mara Provincial Park is noted for fishing, swimming, boating, and as a family picnic area. Note that this is a day-use park only: no overnight camping is permitted, and mooring of boats overnight is not allowed. The nearest public telephones are at resorts and stores located a few kilometres south of the park, or north in Sicamous. If your boat has recently been out of the Province, inspect it for invasive Zebra and Quagga Mussels before entering the water. for more information, here is the link to the Invasive Species of British Columbia web page. Please help to prevent the spread of Eurasian Water Milfoil by removing all weeds from your boat and motor before launching and after removing it from the lake. The park is open with services from May 3 to September 29. The gate is closed during the off season but users may access the park on foot. On the south-east side of Mara Lake, accessed via Hwy 97A. The park is 10 km north of the junction of Hwys 97A and 97B. 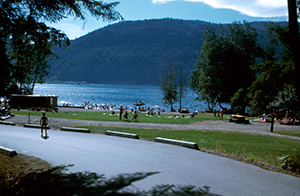 If traveling on TransCanada Hwy #1, the park is 12 km south of Sicamous. Cultural Heritage: There is evidence of prehistoric use of this site by native people. Conservation: The shore of Mara Lake is important habitat for salmon. Approved Purpose Statement and Zoning Plan [PDF] for Mara Provincial Park is available in pdf format. Canoeing, kayaking, power-boating; please note that no boats are to be moored in the park overnight. There are no lifeguards on duty at provincial parks. A paved boat launch is provided. Cold water taps are located throughout the park. Taps are shut off during the off-season. This park has a day-use/picnic area and a parking area/lot. Pit and flush toilets are located throughout the park.